Singapore’s importance in the US “Asia pivot” – or “rebalancing,” as some in foreign policy prefer to call it – is underscored this week by two visits: Singaporean Prime Minister Lee Hsien Loong’s meetings in Washington with President Obama and Defence Secretary Chuck Hagel, and the docking of the nuclear-powered aircraft carrier USS John C. Stennis at Singapore’s Changi Naval Base. The cordial meeting between Obama and Lee at the White House marks strong military ties and cooperation between the two nations, with new rotational deployments of US Navy vessels – as many as four littoral combat ships — in Singapore starting later this month, as the US looks to boost its Asia-Pacific presence. Littoral combat ships are surface vessels designed to operate in shallow waters close to shore, according to a US Embassy media release. Hagel, hosting PM Lee at the Pentagon, discussed issues including tensions in the South China Sea, and accepted an invitation to speak in Singapore at the annual Shangri-La Dialogue, which is held May 31 to June 2. Secretary of State John Kerry with visit Northeast Asia next week, amid tensions on the Korean peninsula. Meanwhile, at Changi Naval Base, visitors over the past few days got to board the USS Stennis, which performs something of a showboat/PR function when it isn’t seeing action (the Stennis launched the final sorties which brought the Iraq War to a close in 2011, and recently completed a five-month tour providing air support to allied troops on the ground in Afghanistan.). 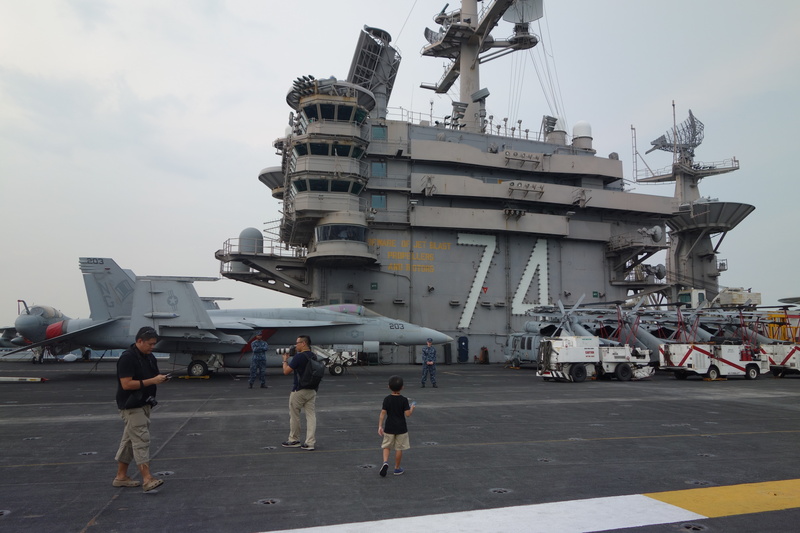 As a colleague described it, the carrier is like something out of Top Gun, the size of four football fields, and carries 6,500 crew and airmen at maximum capacity, and 70-plus aircraft. The floating military base leaves Singapore today for Hawaii before heading to its home port in Washington State. Secretary Kerry and PM Lee make remarks in this newly released video on YouTube.